A meme based on the 1994 Spider-Man episodes titled "The Alien Costume". In Episode 9 Part 3, Spider Man attempts to escape by jumping on a train, causing Eddie Brock (as Venom) to steal a truck and ride along side the train honking the truck horn. 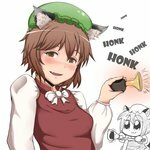 Strangely this meme crossed over to Touhou involving the character Chen (especially bkub's), with Venom honking the horn of a bicycle.